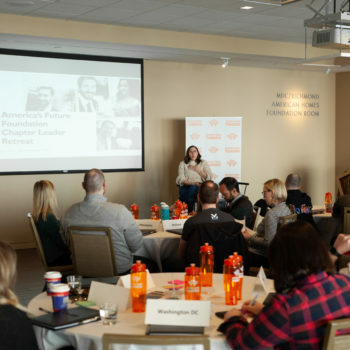 Last week, America’s Future Foundation leaders and board members from across the country teamed up for the annual AFF Chapter Leader Retreat in Denver, Colorado. The AFF-HQ team set out to create an inspirational and community-building experience for leaders, from tasting delicious food staples of Denver, to flying in several well-known speakers, and exploring the beautiful Red Rocks Amphitheater. With sunny weather, spectacular sessions, and a great countrywide AFF team, the retreat stood out as a time to renew our dedication to advancing the principles of freedom. Here are some highlights! Friday’s opening dinner was hosted at Coohills Restaurant, an exceptional culinary experience owned and operated by a local Denver family. The AFF leaders were joined by fellow liberty lover, senior research fellow at the Heritage Foundation, and former captain of the Thunderbirds Airforce team, John “JV” Venable. JV’s speech was the highlight of the night. He captivated the audience by sharing his personal story on how he overcame cancer and beat all odds by rising to become captain of the Thunderbirds. Not only did his story inspire, but it taught lessons on the importance and crucial necessity of teamwork in any given aspect of life. Understanding your team as individuals with human emotions, passions, and goals of their own is critical to building a strong and successful team that can operate together to accomplish a shared goal. We bring that mentality back with us as an AFF team! Saturday brought exciting sessions, and the program’s main focus was providing attendees with insight and new knowledge on their own professional development and leadership. The day kicked off with AFF Executive Director Cindy Cerquitella’s session on our organization’s mission to change the culture towards one of liberty and impact local communities through chapter events. The rest of the morning focused on discussing ways to build intentional communities to ultimately break barriers and improve individuals’ lives. Grassroots Leadership Academy’s Matthew Hurtt led this fun and stimulating session. The afternoon brought a quieter, more introspective session with Lisa Lewis from Lisa Lewis Coaching. She collaborated with attendees to reflect and hone their individual strengths, talents, and values, to create a long-term vision that related to AFF. Everyone walked out of Saturday’s programming with deeper knowledge of community building, personal vision, AFF’s goals, leader expectations, and stronger friendships that extend across the nation. What fun is a retreat if you don’t change the scenery? Part of the retreat included experiencing local culture and places around town. This meant getting outside of the hotel and enjoying a professional dinner at Coohills Restaurant, gaining new knowledge from the History Colorado Center’s Colorado-focused museum, watching March Madness at 10 Barrel Brewing Co., and of course, hiking Red Rocks! 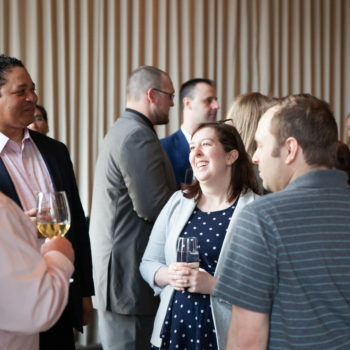 Over the course of the weekend, leaders and board members had opportunities to enjoy each other’s company, learn from one another, and get to know the AFF staff. This type of bonding experience could not have happened without the unique excursions around the city as a group. America’s Future Foundation is a space for ideas and innovation, challenge and conversation, growth and volunteerism. We came out of this retreat refreshed by new friendships, expanded knowledge, and time outside of our ordinary environments. We look to the rest of 2019 and beyond as an opportunity to grow AFF’s community and share the principles of freedom to the next generation–to inspire others and improve people’s lives!